The Assembly of First Nations (AFN), National Native Addictions Partnership Foundation (NNAPF), and Health Canada announced the release of Honouring Our Strengths: A Renewed Framework to Address Substance Use Issues Among First Nations People in Canada at the AFN National Health Forum on November 7, 2011 in Ottawa. 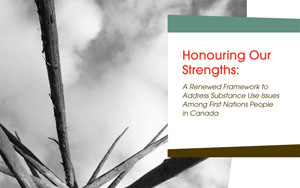 Honouring our Strengths is a national framework to address substance use issues among First Nations people in Canada. The framework outlines a continuum of care in order to support strengthened community, regional, and national responses to substance use issues. This framework is intended to guide the design, coordination, and delivery of services at all levels of the system. It also provides guidance on an approach to community development that prioritizes mental health and well-being and relies upon community and cultural strengths. The NNADAP Renewal Leadership Team was formed in 2010 to exercise leadership in guiding the implementation of Honouring Our Strengths. 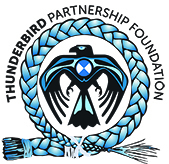 The Leadership Team, with support from AFN, NNAPF, and Health Canada, is working with various networks and partners on strengthening the system of care for First Nations people and implementation is already underway. It is recognized that realization of the vision outlined in the framework will require ongoing commitment, collaboration, and sustained partnerships. This includes the development of tools or guides to support uptake of the renewed vision.